Welcome to the midway point in 2018 National School Bus Safety Week (October 22-26)! Observed by school districts nationwide, National School Bus Safety Week is for the many stakeholders–parents, students, teachers, motorists, school bus operators, school administrators, and other interested parties– who are working to ensure that the nation’s 25+million students are safe while they are traveling to and from school. Each year, National School Bus Safety Week has a theme, based on a poster contest held the previous year. 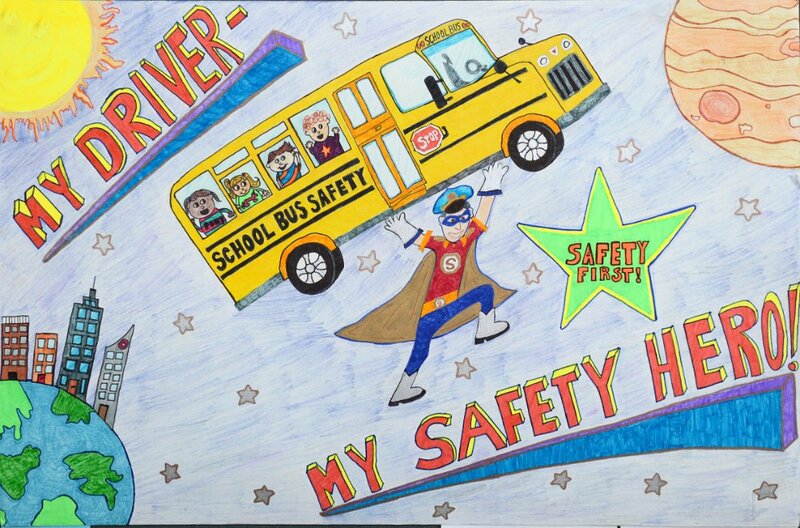 So this year’s theme, “My Driver – My Safety Hero!”, was the theme of the 2017 poster contest (see featured photo of the winning poster). This year’s contest’s theme is “My School Bus, The Safest Form of Student Transportation!” (Look for that poster next year!) And if you want to get out your Crayolas and poster board to get a jump on the contests for 2019 and 2020, the themes for those years are “Red Lights Mean STOP!” and “Can’t Touch This – The Danger Zone,” respectively. The Pinellas Bay County, Florida school district also recognized the 2017-2018 School Bus Driver of the Year, Kimberly Johnston, as well as 72 school bus drivers with 10 or more years of safe driving. Twenty-seven of the 72 drivers have a 15-year or longer safe driving record; and four – Ruth Cobarras, Charles Russell, Yvonne Taylor and Wanda Prosser – have 25 years of safe driving. Congratulations, and thank you for keeping your Florida kids safe! In the commonwealth of Pennsylvania, they are conducting Operation Safe Stop, a public awareness and enforcement effort to educate the public that passing a stopped school bus, especially when children are loading or unloading, is both dangerous and illegal. And the Hawaii State Department of Education (HIDOE) kicked off School Bus Safety Week with a proclamation ceremony on Monday, Oct. 22, 2018, at which Governor David I. Ige encouraged everyone to slow down and pay attention when they approach a school bus. State law requires that drivers come to a complete stop when they see the stop sign deployed and flashing red lights on the school bus. What is your community doing to encourage school bus safety this week? Should the school day start later for teens?